You may have noticed the vibrant art that’s used in the Gala invite, and on this website. 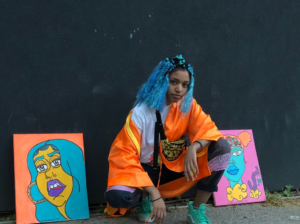 It was created by Fvdge, a Broome Street Academy grad and Door member. We caught up with her between classes and workshops at The Door to find out more. Thanks for sitting down with us, Fvdge. So many people have told us they think the artwork used in the Gala invite is beautiful. What was your inspiration? 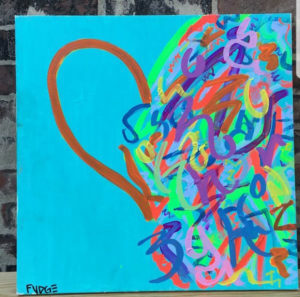 The painting represents finding love in chaos. It’s about how you can be alone and be still like water, and then you allow someone into your life and its chaos. It’s about accepting that person’s chaos into your life and opening yourself up to new possibilities. That’s why I have one open empty side of the heart while the other side is my signature abstract graffiti, I call Fvdgefitti. And actually, this painting actually wasn’t made for the invitation. I painted it and gave it to Jadrien (Assistant Director of Arts Programming at The Door), who I knew before I came to The Door. When they used it in the invitation, I thought it was dope. It was cool the first time I saw it. You might get this a lot, but we have to ask…how’d you get the name Fvdge? Fvdge is actually a childhood nickname. First, my family began calling me that and it easily became my neighborhood nickname. So I decided this would be my artist name as well. What first brought you to The Door? Were BSA and The Door influential in your development as an artist? How so? School is school you know? But I did feel like at BSA I had more opportunity to learn about life outside of high school. The fact that The Door was right downstairs made it accessible to explore my many interests. BSA and The Door put on an annual art fair and I was able to show a piece, and I saw the reaction it got. From there I started to utilize The Door more. That experience exposed me to the feeling of success as an artist and was really eye-opening for me. I think The Door gives you a place and a platform to show off your work and expose you to a new world. This was really like my first step into my art journey and I don’t think I could have gotten better support anywhere else. As a member of The Door, would you recommend it to others? YES. I recommend The Door to my friends and when I do, they don’t believe a place like this exists, because it offers so much. But it does! And it’s not just about art. The Door provides so much more. When you’re younger you don’t always know what you want to do and The Door is amazing for meeting creative people with like minds and giving access to arts you’ve never tried. There’s probably more than a few aspiring artists at The Door. What’s one piece of advice you would give to them? I would tell them to focus on what resonates with you and not on what others want, or what you think others want. Don’t make art for the critics or to sell. Make art for you and your voice. Say what you need to say. Even if it’s wack art, it’s your art. You made it. No one else made it.